Modern Kitchen with counter stools and adjacent dining area. Large first floor master with great views and a fireplace. 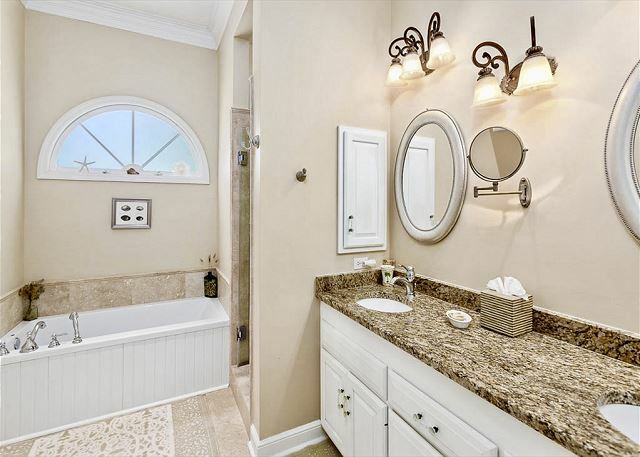 Newly renovated master bath with travertine shower, air jet tub, granite counter top, etc. 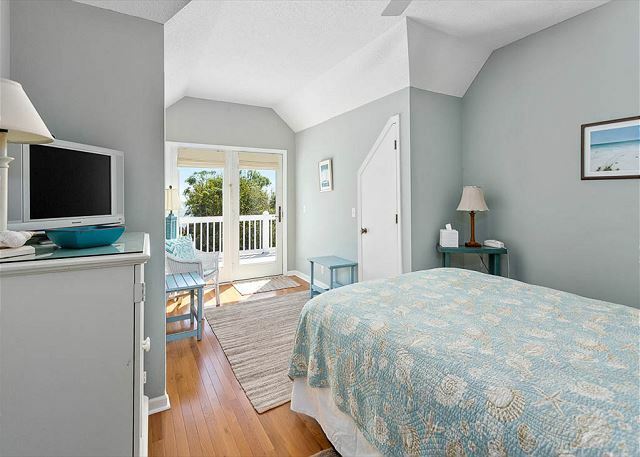 Middle bedroom has inviting ocean views and easy access to upper deck. This unique house boasts a 12 x 23 private pool and three generous porches all with amazing views, including vistas to the south and west of fellow Golden Isles--Jekyll, and Cumberland’s legendary barrier wilderness appeal, and ocean, ocean everywhere. The living room, dining room, kitchen, master bedroom, all have those fabulous ocean views, and airy 10' ceilings. The master is on the first floor, tucked away in the southeast corner of the house with its own fine views across the porch, king bed, two walk-in closets and large, renovated bath with new air jet tub, and shower. 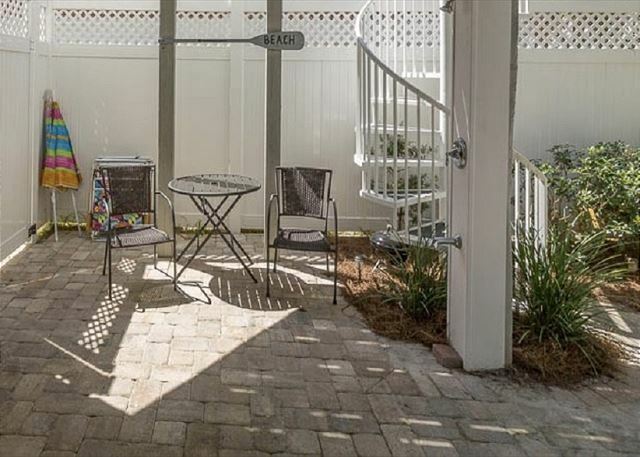 Plus hardwood floors throughout and airy 10' ceilings! The lovely rear porch, where you will want to savor the ocean view with your morning coffee and meals, overlooks the private pool. 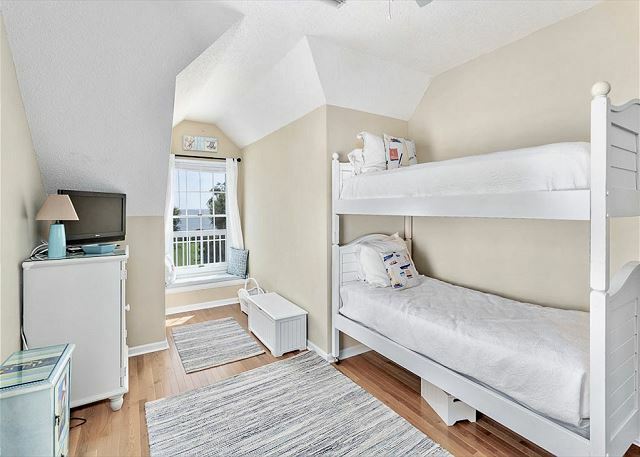 Upstairs, the second-floor features three charming bedrooms--which again all look out on the ocean: All the bedrooms have TVs with DVD players and huge closets as well. The southwest bedroom has a queen, its own bath, desk, bench seat and a comfy swivel chair to facilitate conversation, reading and ocean watching. 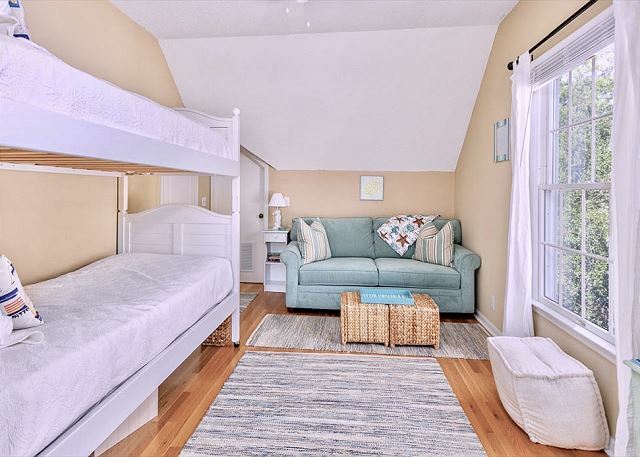 The southeast corner has bunk beds with a queen sleep sofa and shares a hall bath with the dreamy sea-blue middle bedroom which has a queen, and glass doors leading directly out to the upper porch deck. Besides the stunning views and great location, just down the street from the King and Prince Hotel, and close to the Village, there is beach access directly across the way at 5th Street. East Beach, a broad, dune-filled beach area, is a handy bike ride or walk away. You can easily walk west on our beach at low tide over to St. Simons Village, a fun place with shops, restaurants and activities around the Pier and Lighthouse. Dogs are considered. No cats. ADDITIONAL CLEANING FEE $300 & NON-REFUNDABLE PET FEE OF $200. Had an amazing week at this property with family. Plenty of space for large family. The pool in the backyard was a great feature as well. Can’t wait to come back next year! What a great house. The whole family enjoyed the house and how close it was to the beach. We are making plans to book again for next year. Hey Ms Jody! Give me a shout when you are ready to get these plans for next year nailed down! I look forward to seeing y'all again! We are returning guest to Sea Gift! Perfect size for our family vacation (5 Adults and 2 children) with plenty of room to spare. Just steps from the beautiful SSI ocean. Hope to continue making this an annual trip. The house contains everything you need. WE LOVE IT! Appreciate the owners sharing!